If you like art history, San Francisco, and a mystery with diverse characters, humor and a little sexual tension, you can't go wrong with Hailey Lind's books. It's been three years since the last book in the Art Lover's mystery series, but Lind is at the top of her game with Arsenic and Old Paint. Even when artist and faux finisher Annie Kincaid thinks she's taken a routine job, things can go bad quickly. Hired to use paint to recreate the appearance of a Victorian wallpaper that had been ruined, Annie and her team hear a woman's scream, and find an unusual murder scene. There's a man in a bathtub, with a sword in his body, and a woman in a French maid's outfit standing over him. The murder scene reminded Annie of David's painting, Death of Marat. But, that murder is just one of the curious activities at the exclusive Fleming-Union men's club on Nob Hill. Once she's kicked out of the club, and told her services are no longer needed, Annie will do anything to get back in and investigate, even crawl through tunnels. How does Annie Kincaid get into these messes? Before she knows it, her straight-arrow landlord, Frank DeBenton, asks her to look for a bronze sculpture that disappeared. Her business partner, "reformed" art thief, Michael X. Johnson, gone for a few weeks, appears and disappears at the most inopportune moments. And, in a family of forgers, it appears that her beloved "Uncle" Anton might have been involved in the forgery of a Gauguin that has disappeared. Forgeries, stolen art work, and the reappearance of thieves and forgers in her life. As Annie says, "When there are a lot of coincidences in my life things tend to go bad, fast." Even Annie's love life is a mess. She's attracted to both bad boy Michael and straight-laced Frank, who might have a mysterious past himself. The only solution is to turn to chocolate, lots and lots of chocolate. And, a complicated investigation doesn't hurt. Although Annie continuously tells Michael they're not investigators, she continues to delve into the disappearance of art work, and the story of tunnels under Chinatown and Nob Hill. Hailey Lind successfully intertwines the mystery and history with Annie's amusing life. Annie's friends are a remarkable, unusual group of people, and some of the pleasure in reading these books is meeting up with Annie, her family and friends again. 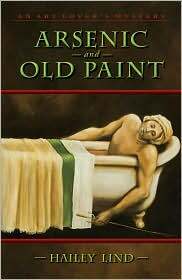 Arsenic and Old Paint is the best book of the series, so far, but, if you haven't read any of them, I recommend you go back and start from the beginning. It's worth reading about Annie and her unusual group of acquaintances. Nothing is any better than a good mystery with a strong group of characters. Arsenic and Old Paint, and Hailey Lind's other mysteries, offer a wealth of unusual characters, along with a fascinating look into mysteries in the art world. Arsenic and Old Paint by Hailey Lind. Perseverance Press, ©2010. ISBN 9781564744906 (paperback), 272p. FTC Full Disclosure - The author asked that the publisher send me a copy of the book, in hopes I would review it. I enjoyed Hailey Lind other Art Lover's books immensely. I'm so happy there's another one to read! Sounds like an excellent book, thanks for the review. It's been a while since the last Art Lover's Mystery. It was good to catch up, Laura. Yes, if asked, Elizabeth, I'd recommend starting at the beginning of the series. You're welcome, Man of la Books. I enjoyed this one. I hope with the publication of this new one the older ones will become more available -- I haven't read them but they look delicious. I hope you can find them as well, Tina. It's hard when there's a three-year break. But, you really should read the first ones. I do have the first in this series at home..really need to read it don't I? Love the title for the newest one too. Well, I think you should read the first in the series, Kris, if you intend to read others. But, just my opinion. I'm sure the author(s) will be happy if you pick this one up!